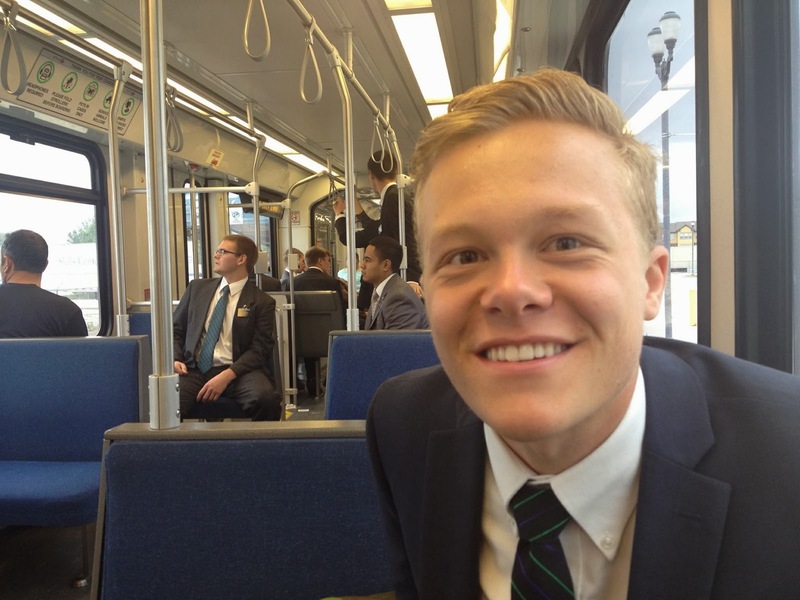 Brent and Oli accidentally bumped into each other on Frontrunner on Wednesday, Sept 25. Oli and been on the upper level, and Brent right below him for 40 minutes before Oli came down to switch trains to Trax. Brent thought he was being attacked by a homeless person until he realized it was Oli. They hopped on Trax and got to spend about 20 minutes together. Oli and several other elders were on their way to SLC to pick up their visas. Yes I got your package. Thank you so much I told everyone they could eat whatever they want, excluding the apples and the peaches, and if they did eat of this forbidden fruit they would be in biiiiig doggie doo doo trouble. I will look for Lexi, and I hope to see her. On Saturday, your super coordinated son sprained both his ankles. I was walking down the stairs. I kind of rolled one and tripped, then I jumped off that foot, and jumped about four feet out, four foot drop, landed on both my feet and simultaneously rolled both of them. One is pretty bad, I went to the doctor and got a brace, because my whole ankle was masssssive and it is bruising. The doctor said everything I wanted: that I will be fine, and that I should just wear the brace and ice it. I just wanted to make sure I'd be fine going to Mexico. The Tuesday night devotional was given by David S. Baxter of the 70. Right at the beginning, one of the big things he said that really hit me was"you are leaving your family for a little bit, so you can help others be with their families forever." I like this, because .... I don't know just think about it and you'll like it too. He talked about why we don't use a symbol for our religion, specifically the cross. He said, 1. we believe that christ's ministry did not end on the cross, and the cross was just a part of what else needed to happen. 2. There are so many other events that happened other than just the cross, the garden, calvary, resurrection. 3. We don't want our symbol to be something small and forgetable like a cross, our symbol should be shown by the works and attitudes of our people. Other things I liked... Faith without works is dead, you have to do more than just believe---act on it. When other religions want to argue that in the Bible it says to not add any more scripture (last chap. in Revelations) He answers that, with that was John speaking, meaning he did not want other people adding to the book of revelations. and WHY would god want to keep giving us guidance thousands of years ago? He wouldn't, God loves us, thus we needed an updated part. Also in the bible, it says there are books missing, and he made the point that if those other books were recovered, people would not reject them, even if they were added to the Bible. He then ended giving a ton of statistics about welfare projects the church has helped with. I would suggest looking at those stats. Because they are incredible. Also it was cool, that in a tsunami in indonesia, the church bought 700 Kurans for the affected area. He also said we need to be respectful of every other religion, which I liked a lot because a lot of times we think that just because we think we've got it all, that everyone else is dumb. But we need to love everyone. I love you all so much. I hope the email and the paper letters fills you in with my life as you need.